Economical but powerful, the Triumph fireplace is a refined freestanding stove that can effectively heat a medium to large space with ease. With a timeless design that looks dignified but discreet, the fireplace is crafted from the very finest quality black steel what will keep you warm for many year of chilly nights to come. 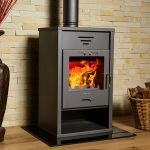 Despite its affordability, the Triumph will surprise you with the speed with which it heats your home, while still being incredibly efficient on wood. In addition, all Hydrofire fireplaces are imported from Europe and boast a strict CE certification, so you know you can rely on the quality of any model that you buy from us. Just to ensure you sleep well at night, our steel fireplaces come with a 2 year warranty too.